Figure 1. This sapphire blue hot spring, termed ‘SJ3’, is located in the Smoke Jumper Geyser Basin in Yellowstone National Park, Wyoming. This medium sized sapphire blue colored hot spring in Yellowstone National Park (YNP) (Fig. 1) looks innocuous enough compared to the other 14,000 colorful springs, mudpots, and geysers that attract upwards of 4 million tourists to the Park every year. 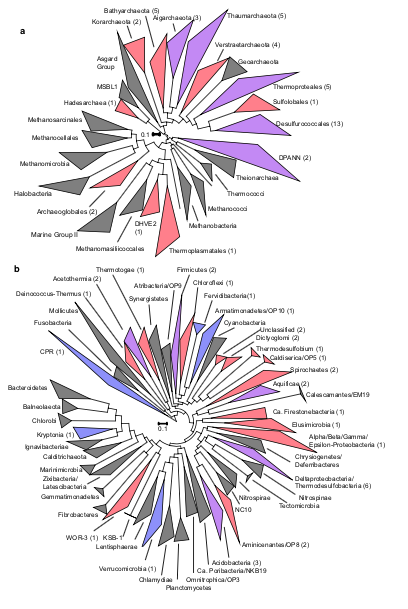 Yet, despite the unassuming appearance of this spring that we call ‘SJ3’, in a recent Nature Communications manuscript we show that SJ3 hosts an incredible amount of bacterial and archaeal genomic diversity. This includes numerous lineages with functionalities that have not been previously detected in hydrothermal systems. Moreover, this study provides important new insight into our understanding of the subsurface geologic processes that promote and maintain microbial diversity in hydrothermal systems, including the primitive metabolic processes of methanogenesis, methanotrophy, and dissimilatory sulfate reduction. The unique geochemistry of springs in the Smoke Jumper Geyser Basin of YNP drew the interest of our lab at Montana State University because of our specific focus on elucidating the role of hydrogen gas in supporting the energy metabolism of chemosynthetic microbial life (that is, life supported by chemical rather than light energy). 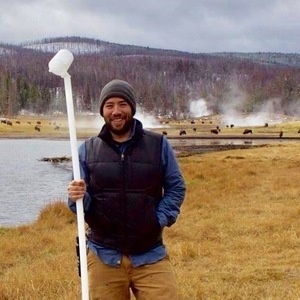 Previous geochemical studies of hot springs by United States Geological Survey scientists pointed to particularly high levels of deeply-sourced volcanic gas (e.g., hydrogen gas) in springs of the basin, which is ~16 km from the nearest road. 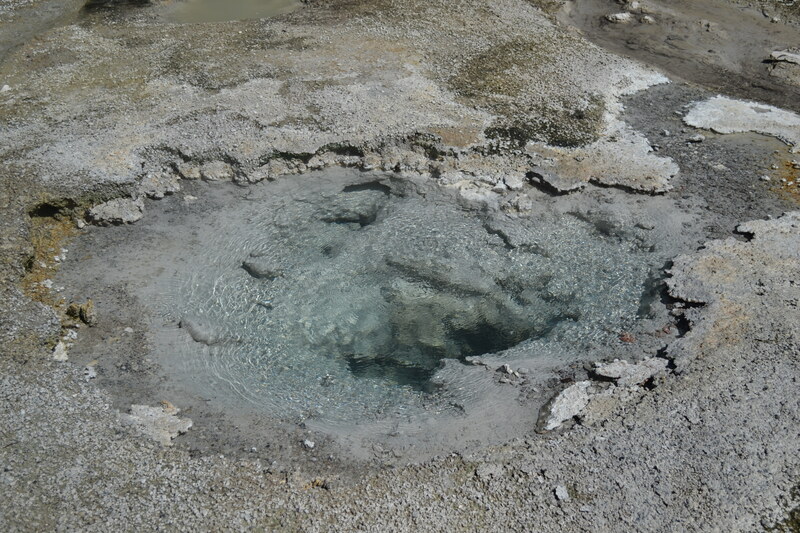 Thus, of the dozens of geyser basins in YNP (many of which are much more easily accessible…), the Smoke Jumper Geyser basin seemed to be the perfect place to begin to understand how geological processes lead to elevated hydrogen in hydrothermal systems, and how this in turn supports chemosynthetic microbial life. In another paper that is currently being considered for publication by the authors of this paper and others (Lindsay et al. ), we used deep metagenomic sequencing to identify some of the major microbial populations involved in hydrogen oxidation in ‘SJ3’. However, when we analyzed the metagenomic data, to our surprise, the ‘SJ3’ community was replete with dozens and dozens of uncultivated archaeal and bacterial lineages (Fig. 2), many of which have never been characterized from hydrothermal systems. Moreover, many of the lineages that we detected in SJ3 have recently garnered significant attention because of their potential to inform on the evolution of methanogenesis (e.g., the ‘Verstraetarchaeota’ and ‘Bathyarchaeota’), the nature of deep branching microbial lineages associated with subsurface environments (‘Hadesarchaea’ and ‘Acetothermia’), and many other enigmatic lineages (e.g., ‘Korarchaeota’, DPANN- and candidate phyla radiation-related groups). What’s more – we identified unique metabolic processes in organisms affiliated with the Archaeoglobales, a group of organisms that have served for decades as microbial lab rats in the study of sulfate reduction. However, unlike canonical sulfate reducing Archaeoglobales, one of the ‘SJ3’ Archaeoglobales populations is likely to not reduce sulfate but rather support growth through the primitive process of methanogenesis. For us microbiologists that have been studying the geomicrobiology of hot springs for a combined >3+ decades, the ‘SJ3’ community was truly weird. Figure 2. Phylogenetic reconstruction of archaeal and bacterial population level genomes from SJ3. Trees representing the major a)archaeal order- (or class/phylum-) level lineages and the b)bacterial phylum-level lineages. Lineages are collapsed as triangles with the taxonomic designation provided next to it. The numbers of genomes that were identified in a specified lineage are indicated in parentheses. Lineages encompassing genomes from 'SJ3' that were estimated to be > 50% complete are shown in blue, those with genomes > 75% are shown in red, and those representing multiple genomes that ranged in completeness from 50 to > 75% are shown in purple. 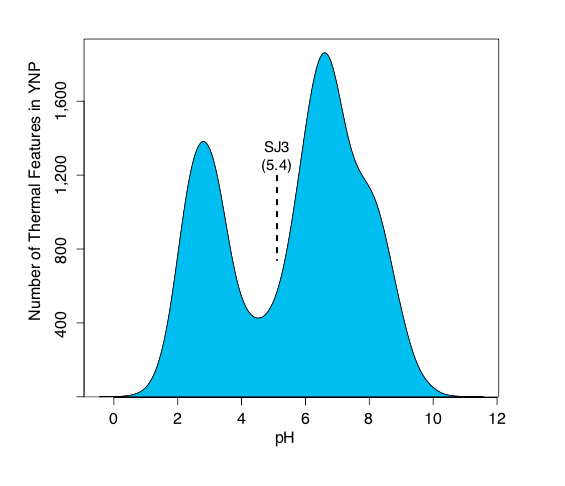 The unique geochemistry of springs in the Smoke Jumper Geyser Basin, in particular ‘SJ3’, and the role of this geochemistry in supporting exceptionally high levels of diversity is not coincidental. Rather, we show that it is due to its geographic location, and not to mention that it sits atop one of the world’s largest active volcanoes. ‘SJ3’ is located at high elevation on the continental divide, features that prevent deep hydrothermal water aquifers from reaching this area (water does not flow up hill). Rather, ‘SJ3’ and other similar springs, are fed by high levels of volcanically-sourced gas generated by decompressional boiling of hydrothermal waters as they ascend to the surface. These gases can mix with near surface waters such as recent rainfall or melted snow (i.e., meteoric water), which is what is inferred for ‘SJ3’ based on geochemical proxies. In many instances, these processes lead to springs that have only moderate acidity (pH 5-6), which are relatively rare in YNP and other hydrothermal fields across the world (Fig. 3). We show that increased mixing of volcanic gas and meteoric waters in hot springs supports increasingly biodiverse communities in ‘SJ3’ and in other springs across YNP that are sourced by similar fluid types. Fig. 3. Distribution of spring pH for ~7,700 thermal features in YNP. The bimodal distribution is typical of global continental hydrothermal fields due to the predominant sourcing of springs by either 1) deep hydrothermal fluids that are circumneutral, or 2) the waters that have become acidic (pH ~2-4) due to the oxidation of volcanically-sourced sulfide gas (H2S). Springs with pH between 4 and 6 are relatively rare and are sourced by various fluid mixing mechanisms. Distribution data taken from an inventory of YNP thermal features conducted by the National Park Service (http://www.rcn.montana.edu). Why would mixing of different fluids lead to high microbial diversity? Imagine the combination of dinner plates one could make with a buffet comprising a single type of food (say barbecue). Now imagine if vegetarian food options were included, then seafood options, and then numerous different regional food options. As the number of different food options increased, so would the number of different options to fill up one’s dinner plate. In effect, this would provide dinner options that would please a greater fraction of the buffet patrons, when compared to a single food option, and potentially keep these patrons coming back to eat at the buffet in harmony. In the case of ‘SJ3’, the volcanic gas is very reduced (i.e., hydrogen, methane, carbon monoxide) whereas the meteoric water that it infiltrates is very oxidized – about as different of fluids as one could imagine. Thus, in analogy to filling up your plate at a buffet with many very different and available food options, the mixing of very different fluid types likely enhances the number of substrate combinations that can support microbial life, leading to higher diversity and providing new opportunities to specialize in the use of a particular set of substrates. Indeed, the microbial community at ‘SJ3’, and in other similar springs, appear to be well poised to take advantage of the unique ‘gassy’ environments they live in. Although hydrothermal environments like ‘SJ3’ are highly understudied and generally rare in the YNP hydrothermal system (Fig. 3), they appear to be critical for understanding thermophile diversity and the evolution of important microbial metabolic processes. It is likely that additional studies of such systems and the intriguing organisms within them will yield additional important insights into their microbial ecology and will shed new light on their role in the evolution of biogeochemical processes. I'm an environmental microbiology with interest in understanding how microbial populations interact with one another and their environments, both now and in the geologic past.